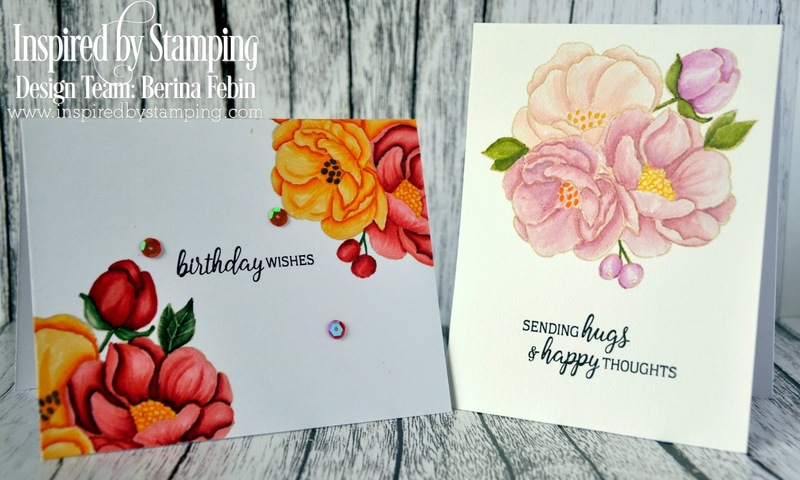 Welcome to Inspired by Stamping’s July 2017 Release! We are so happy you are here. This week Inspired by Stamping is releasing 3 new stamp sets and 2 new coordinating die cuts to their store. All new products are already available in the store! 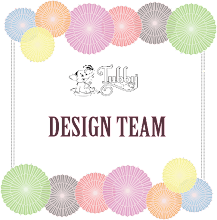 You can visit us by clicking here! Today we are showcasing the Summer Bouquet stamp set. I've made 2 cards to inspire you today. It's no secret now that I love to color flowers. This flower bouquet was a pleasure to color, both with copics as well as watercolors. For my first card, I stamped the bouquet on the top right and bottom left corners of the card panel with Distress ink Antique Linen and colored it with copics. I used the colors R59, R29, R35, R32 and R22 for red colored flowers, YR68, Y38, Y35 and YR31 and Y99, YG67, YG63 and YG61. 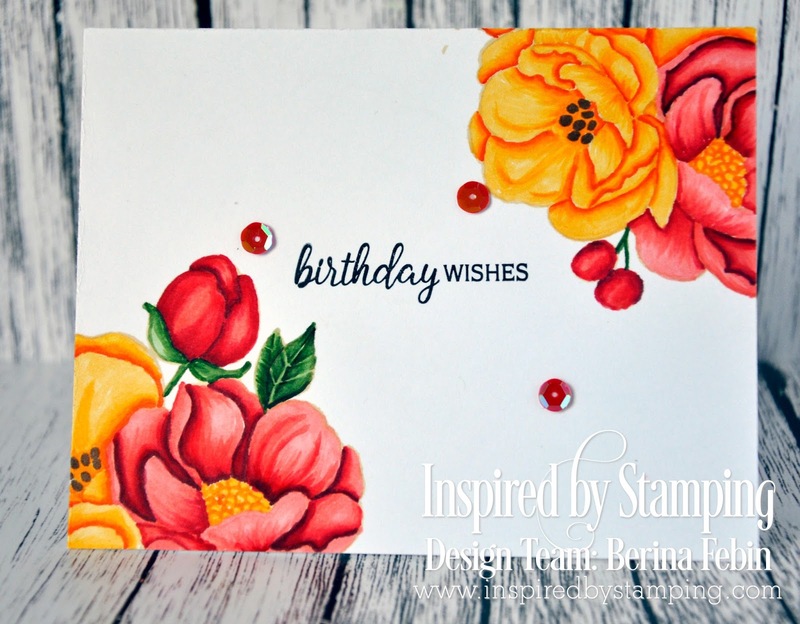 I stamped the sentiment "birthday wishes" with Hero Arts black ink and added a few red sequins from the Inspired By Stamping Valentine's Day Sequins. I wanted the colored flower bouquet image to be the focus of the card, so I left it clean and simple. For my second card, I decided to go with no-line watercoloring. I used distress inks as watercolors. I stamped the image with Antique Linen. I used the colors Victorian Velvet, Tattered Rose and Seedless Preserves for the flowers and Bundled Sage for the greens. Once again, I wanted the colored flower bouquet to be the focus. 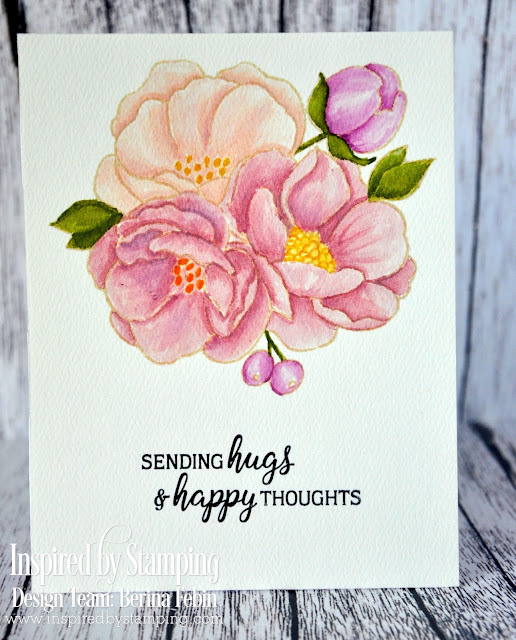 So I stamped the sentiment "sending hugs & happy thoughts" with Hero Arts black ink and left it at that. That's all from me for today. 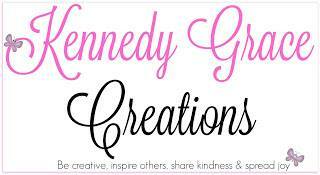 Do visit me tomorrow for more inspiration and a new stamp set with coordinating die. To Celebrate this release, Inspired by Stamping is giving away a $25 gift card to three lucky winners! 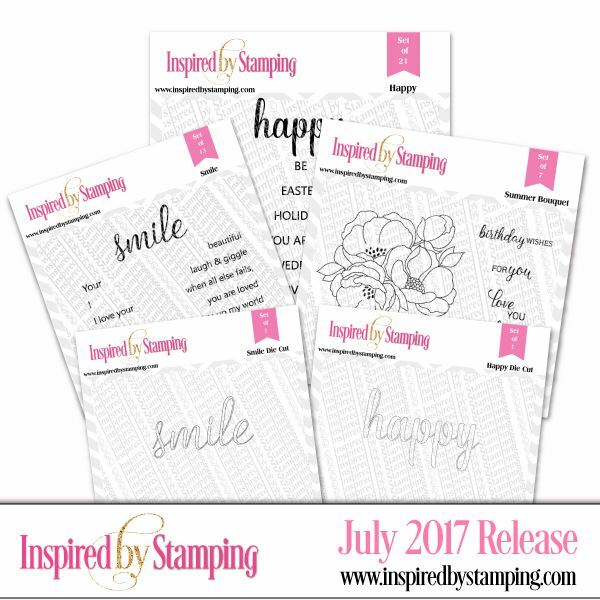 Please leave a comment here on the Inspired by Stamping blog by Sunday July 16th at 11:59 pm EST for a chance to win. The winners will be announced on Monday July 17th. I love the gorgeous colors of these flowers. The first card is like sunshine, bright and beautiful. Love the coloring on both the cards. Your coloring is amazing. Love the beautiful cards. Awesome cards! Love your Copic coloring! Your cards are beautiful. Thanks for providing the colors you used. Oh My Gosh! Your cards are just beautiful!!! Such beautifully colored flowers. These cards are so lovely. TFS. Gorgeous cards, the new stamps are fabulous and you have showcased them beautifully. Beautiful cards. Especially love the watercoloring. Thanks for sharing! Beautiful cards. I love that you created one with vibrant colors and another one with soft colors. Both of these are lovely, but the bright orange with red edges just elicits a 'WoW! '!